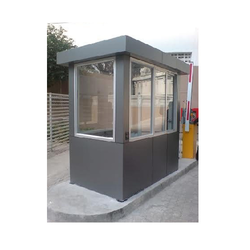 We are engaged in Manufacturing, exporting and supplying Security Cabins, Security Guard Cabins, Portable Security Cabin, Office Security Cabins used for Housing Offices for the Security Staff thereby Offering Instant Cabin Solutions for Running Security Offices on Sites, Corporate Offices and Industrial Establishments etc. Security Cabins are Portable and can be transported from one Site to another Site within Minimum time, thereby, saving time and Money while executing Major Projects. These Cabins are fitted with Metal Doors and Glazed Metal Windows with Sliding Shutters which can be locked, and are fitted with Mild Steel Grill which is Totally Welded to the Frame thereby Assuring Safety. These Cabins are provided with Working Tables and Chairs. Partitions can also be provided for Security Managers.